This was a great tour! 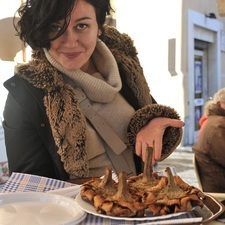 Both the food and the places we visited were great ways to discover Roma and its cuisine. Flavia showed up the neighborhoods and secrets to understand food from Lazio and other regions of Italy while you walk through the magic old streets of this amazing city. I had fresh mozzarela di buffala at some point that was mind-blowing. This was a great tour! Tevz knows his way around and every place was interesting. I learned a lot about history, art, geography and culture from Ljubljana and Slovenia in general and both the bike and the route were comfortable and enjoyable. I want to go back and discover more of Slovenia in the future, for the most part for what I learned in this tour. I was also just for one day there, so this was a perfect plan for the short time. Recommended. All reviews by Luis F.
All reviews for Luis F.